My great grandfather was Mr P Mashall. He was born in 1869. After refusing to do his final examinations at Cambridge, he was sent out the colonies in disgrace. He spent his working life in Burma as a manager for the Bombay Burma Trading Corporation. 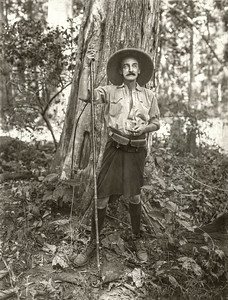 His job was to supervise the extraction of teak timber from the jungle. He spent much of his time living in a tent whilst overseeing the workers as they chopped down the teak trees and transported the logs to the sawmills. As you will see from his photos, this was no easy task and many challenges lay in the way. My great grandmother also lived in Burma but their four children, including my grandmother, Ottilie, were sent back to England to be brought up by governesses and be educated at boarding schools. Sadly my great grandmother died young, succumbing to diabetes in her thirties. In the days before insulin was available, it was a fatal disease. My great grandfather became interested in photography and recorded the teak logging exploits on film. The photograph album and his old camera have remained in the family attic for many years. I have scanned and restored the photos from the album as well as adding copies of the captions that describe each image. 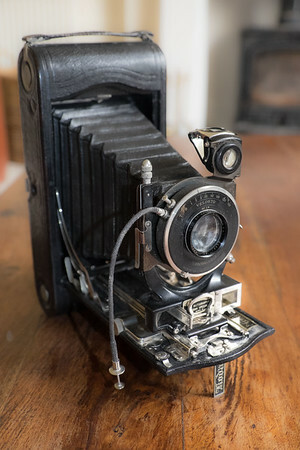 Here is the old camera that he used. 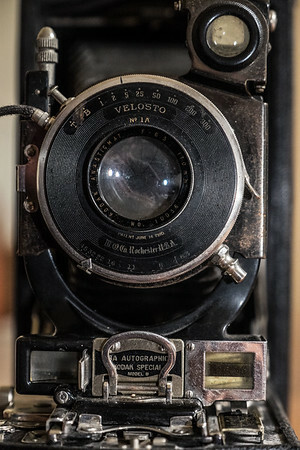 It is a Kodak Autographic Model B.